"A venture is most prone to failure during its first three years of operation - the so-called 'valley of death'. A key to getting through these early years is to avoid the obvious mistakes." Ё from 'Devising Venture Strategies', Invest-Tech Ltd. If it's static, it's obsolete. If it's certified, it's obsolete. LEAD – Learn, Experiment, Adapt, Differentiati – if you wish to win in today's hyper-competitive marketplace! – Can the product or service actually be created? – If the product can be developed, can it actually be produced in appropriate volume? – If the product can be made, can it be sold effectively? – If the product can be sold effectively, will the resulting company be profitable and can the profits actually be realized in a form that allows investors to receive cash? – If the company can achieve operating profitability at one level, can profitability be maintain as the company evolves? Management of the venture-building process is fundamentally different from corporate management that is focused on delivering the annual operating plan. 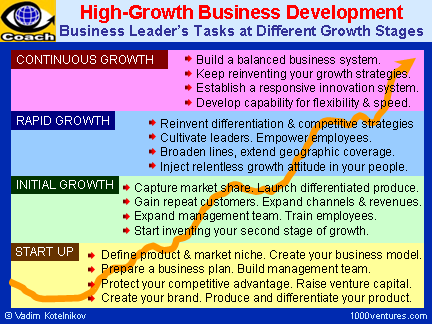 Management of a new high-growth business is built around a customer-driven idea or a technology. It requires entrepreneurial mindset and skills. Being first to the market is the top priority for the venture manager. What makes a venture succeed is the ability to identify emerging attractive markets and to seize on unmet, unserved customer needs. Successful business is ruled not by the founders' decisions, but by the marketplace. And the marketplace, in turn, is ruled by "fears and passions". People will only buy what they want to buy, or are afraid not to buy. And these "fears and passions" change every day. "Selling is not about content, it is about fit. "5 The analysis of the market potential and search for the right fit separates the inventor from the entrepreneur. Have the market researched, and develop an effective marketing, advertising and selling strategy. Build a prototype and test market your product or service; identify the price at what you could sell it. Hot markets do not last forever. So, be prepared to adapt quickly to the market changes. The market focus means flexibility: watch the market dynamics, spot what has gone wrong, and move quickly to turn market changes and your errors into opportunities. Creating customers and better servicing them is the true purpose of enterprise. In today's highly competitive world with many players, "you need to be able to articulate your competitive advantage in a matter of minutes, if not seconds. If you cannot, you will lose your prospective customer's attention, and the business4". Your effective positioning strategy will help you to get seen and heard in the overcrowded marketplace. It's impossible to grow a successful business as a one-person operation. Sooner or later, you will have to share responsibility with one or more partners. Thomas Alva Edison, an inventive genius who took out more than 1000 patents, started several great companies. However, every one of them collapsed once it got to middle size, and was saved only by booting Edison himself out and replacing him with professional management. You cannot achieve success with a Class A idea and Class B management. Turning a great idea into a great business requires professional managers and market experts. In case you cannot afford top management, you would need to build your management team from within, developing their own management skills. The core team should be picked very carefully because its business and interpersonal style becomes the foundation of the company's culture and grows the value system. They should have an impressive track record, skills, and depth of experience in the areas most important to the sustainable competitive advantage of the company. Don't settle for a few average employees - "if you want a track team to win the high jump, you find one person who can jump seven feet, not seven people who can jump one foot." When building your management team, remember also that top-quality people often emerge from bankruptcies. Prior bankruptcy experience is valuable - failure has its rewards. It is often better to hire a leader who learned from mistakes than it is to hire someone who was just lucky. There are several types of strategies followed by successful companies. A careful study in this area will help you to sort out the kind of your enterprise strategy that could be used best. Strengths-Weaknesses-Opportunities-Threats (SWOT) analysis is to be carried out to define your company's sustainable competitive advantage areas and develop an appropriate business strategy to capitalize on it. Strengths and weaknesses of the venture's major competitors need also to be assessed. Having that exercise completed, you must position your company and its first products against its prime competitors. Positioning is very hard work, and you may need to call for help from a start-up consultant, a marketing expert, or an experienced business executive. Your strategic thinking, vision, and business strategy development exercise need to be supported by a set of analytical techniques. Many ventures fail because they fail to understand capital requirements of their growing business. Focus on your cash flow and start preparing for the next stage of venture financing well in advance. What Are the Venture Capitalists' Investment Criteria?